It’s been a couple of months since the rollout of new technology to Cabinet Office staff and it’s now a frequent sight in some buildings to see small groups of people meeting in break-out areas, huddled over their laptops. Rewind to October 2013, and the picture was not quite as rosy. Back then, staff told us during user research that they would very rarely take their laptops anywhere because they were heavy, unreliable and the wifi was patchy. The old laptops also needed to be attached to a cable at their desks to access shared drives. 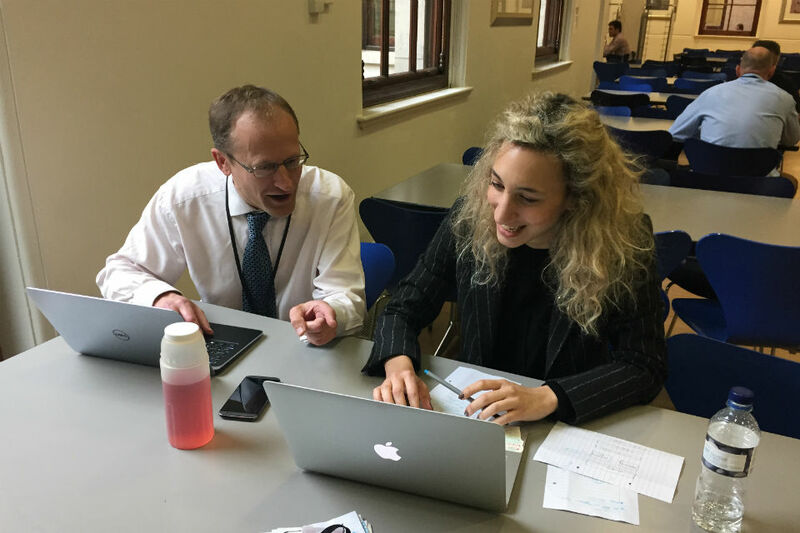 The Cabinet Office Technology Transformation (COTT) programme started rolling out to staff in October 2014 and has resulted in over 1,700 Cabinet Office staff receiving new laptops, new software (Google Apps for Work) and access to the internet and cloud-based apps. And high quality wifi has been installed throughout the Cabinet Office estate in Basingstoke, Norwich and in all the London locations. I have been speaking to representatives of different teams across CO, and it’s clear that the change in technology initially presented a challenge of some degree to everyone. For instance, many people have found the switch from Microsoft to Google difficult - not because one or other is better or worse, but because years of familiarity make switching hard. Now that the dust has largely settled on what has been a hugely ambitious and challenging initiative, though, I’ve been curious as to whether it has made a difference to the ways in which staff are working. And from what I’ve heard, it sounds like positive changes are happening. Even those teams who miss their old Outlook and Calendar admit that they don’t miss the 7-15 mins it used to take for their old computers to boot up - or the same amount of time to log off. One member of staff in the Commercial Models team reckoned she had gained 30 minutes in her working day due to this alone. The lighter laptops, longer battery life and all round better connectivity are enabling remote working on the move, from home and in other government departments’ offices (both in Whitehall and regionally). This new flexibility in where we work has created some interesting opportunities for collaboration. The Cities and Local Growth Unit, for instance, formed a joint working team with colleagues in BIS and DCLG, and started working in the DCLG’s office in Marsham Street every Friday. Also, in a development that must be good news for the environment, many are now reading documents on their laptops in meetings, rather than printing them. And many are typing directly into their laptops, rather than taking written notes in meetings - doing away with the need to transcribe notes later. While there are differences in the degree to which teams have embraced the new collaboration tools such as Google Docs and Google Hangouts, there is no doubt that the ability to work on documents together in real time has been a revelation to some teams. This doesn’t mean everybody is a convert to Google Apps for Work - in moving to new tools, people inevitably find some new functions that they like and miss other functionality that they’ve become accustomed to using. And sharing documents with Departments which don’t work in Google Docs is not as easy as most would like. But the consensus seems very positive for a department where many staff work on policy documents with colleagues located in different locations. The fact that monitoring the size of your Inbox - and frantically having to delete emails when you’ve reached your limit - has become a thing of the past, thanks to Google Mail, which has no limit. That desk space pressure has eased for some teams now that more remote working is taking place. That having access to work productivity tools such as Eventbrite and Survey Monkey is making a big difference to the organisation and running of events, the circulation of team surveys etc. That “attending” meetings taking place in the office when working from home or remotely is now doable thanks to Google Hangouts. And that Hangouts are also proving easier to hold in the office as you no longer need to book special equipment. And “it just works”. That the new system rarely crashes so “it’s almost impossible to lose your work”. It has to be said that the COTT team anticipated a lot of these benefits. The user research conducted at the outset of the project - and throughout the rollout with the Trial Users - meant that they had a pretty good idea of the eventual upsides to the project. One staff member from the Fraud, Error and Debt team talked about greater feelings of inclusion in his team now that more documents are being shared with them for their input. (Again, the limitless Inbox is undoubtedly a factor here.) And also that there is now greater visibility of individuals’ contribution on shared documents, as everyone can see every single individual’s comments, rather than their comments being aggregated by their line managers. In some cases, this is giving rise to reappraisals and new appreciation of colleagues. There also seems to be a higher level of trust from Managers when it comes to their team members working away from the office. Managers seem to be more relaxed as they know that staff have the wherewithal to get on with their work and won’t be hampered by remote connectivity problems. Lastly, I heard about a greater willingness, among some staff, to travel to meetings around the country as travel time is no longer considered “lost” working time. Being able to view documents on phones and to access the internet and shared documents when away from the office has made it easier to work on the move. Technology change programmes are rarely easy or straightforward - and the COTT programme has been no exception. Technical glitches at the start of the rollout affected printers, wifi connectivity and the transfer of existing files from the old Flex-R system to the new system. Happily, the major issues have been resolved and the Service Desk is working its way through a backlog of “tickets” relating to individual problems. And the Digital and Technology Team will continue to improve and evolve the technology service to best meet Cabinet Office users’ needs. What’s clear is that the new technology in Cabinet Office is enabling new ways of working which are giving staff something to cheer about. Really exciting to see this. Are any departments trying the equivalent scale of change on a Office 365 platform with lightweight high-speed modern infrastructure & new PCs, to see the differences and hedge bets in case of future platform preference changes? 2. Would the document sharing & interchange problem be one that government and industry now have a common interest in mandating? It seems as if it is a block to an essential part productivity in an open market for applications (maybe today it is just Word vs Googledocs, but tomorrow you'd expect this requirement to explode alongside a free-market take-up of cloud apps). Hi Jonathan and thanks for your questions. A number of departments are evaluating Office 365 alongside other options to see if it meets their users’ needs. The Office of the Chief Technology (OCTO) is helping departments address the challenge of interoperability through its work on open standards (https://www.gov.uk/government/publications/open-standards-principles/open-standards-principles#open-standards-principles) and the development of Common Technology Services (CTS). Microsoft and Google have both committed to support Open Document Format (ODF) as a result of the team’s work. CTS is developing blueprints for the deployment of email and collaboration products which will include cross government access. Brilliant to see the CO stepping up and being an exemplar of both new technologies and using them to enhance ways of working to be more inclusive and sustainable. Only possible downside is 'always connected' and the temptation to access at all times and be working longer not smarter. Are you looking at this? This all sounds fantastic, but looking in to the real world, away from head offices with nice shiny new IT. Working front facing with kit that sometimes works, workarounds to workarounds, known problems, new kit that use is suspended of (again). The new PC's we were given not up to the job, and all the while trying to convince our citizens that digital is the way forward. What do you do when you want to work on something sensitive? Does everything go into Google/similar cloud services? So this is where all my tax money is going, on overpriced Apple devices that aren't business devices and are a pain to connect to AD networks (which is what the Cabinet Office still has). What was the reason for not using Microsoft 365 that would of been cheaper due to their Enterprise Agreement? And why is the government using a product from a company that has been avoiding UK tax for years? Google Apps for Work came out ahead in user ratings in research conducted by the user research team in Cabinet Office with various productivity suites. Google Apps for Work was also the cheapest option available that met both our user and technical needs. When it came to laptops, we gave staff a choice of device from a list of five different lightweight laptops, with either a Windows or Apple Operating System. To date, take-up has been 52% in favour of Windows OS and 48% in favour of Apple OS. How about the new Windows based Stick-PC devices - do these have a place in this IT transformation? If you already have a fully functional smartphone or phablet device on which you can do work when travelling, do you need a full laptop at home or in the office? After all they are probably £800 - £900 by the looks of them and the smartphone would be around £300 to £400? Why can't you just carry around a device that's about the size of a large 3G dongle and plug it in at home (use your monitor, keyboard and mouse with your home Wi-Fi) or into a hot-desk when you're at the office? The 'PC on a Stick' is an emerging market and one that offers new possibilities with remote and flexible working. However, at the time of the project these devices were in their infancy and in providing highly mobile laptops we felt we met the needs of the users when it came to home working and working on the move. One thing that come out of the user needs research was that a mobile phone/tablet is ideal for dealing with emails and browsing the web but that users would prefer to work on a fully functioning laptop if working on anything else. That said the development of these types of devices will continually be monitored for their suitability. https://www.gov.uk/government/uploads/system/uploads/attachment_data/file/251480/Government-Security-Classifications-April-2014.pdf is clear that you don't need different technology solutions for things considered sensitive, only different handling by the user. Did the CO face any issues with providing reasonable adjustments to staff who require specialist soft/hardware, eg accessibility software, larger screens, and specialist keyboards and mice? How were such issues resolved, and how easy was it? I am interested as sit on the Disability Steering Committee in MOD and we are facing a change to Office 365. Are you able to share any lessons learned? Users with access needs were involved in every step of of the transition, starting from understanding their needs, through to picking a solution, transition and post-transition support. I can email you separately if you’d like to discuss the work we did in greater detail? I have a couple of colleagues who are visually impaired and who's needs have been addressed with the new Cabinet Office system. I am sure they would be interested in offering feedback on getting the best from our system from a personal perspective. Excellent use of technology. Am I correct in thinking that the devices don't use a VPN connection? How have you satisfied the CESG data in transit protection requirements?